This is a truly amazing apartment with views of all of Barcelona. It is a modern and chic loft apartment, located in Barceloneta, right next to the beaches of Barcelona and within walking distance from the city centre. 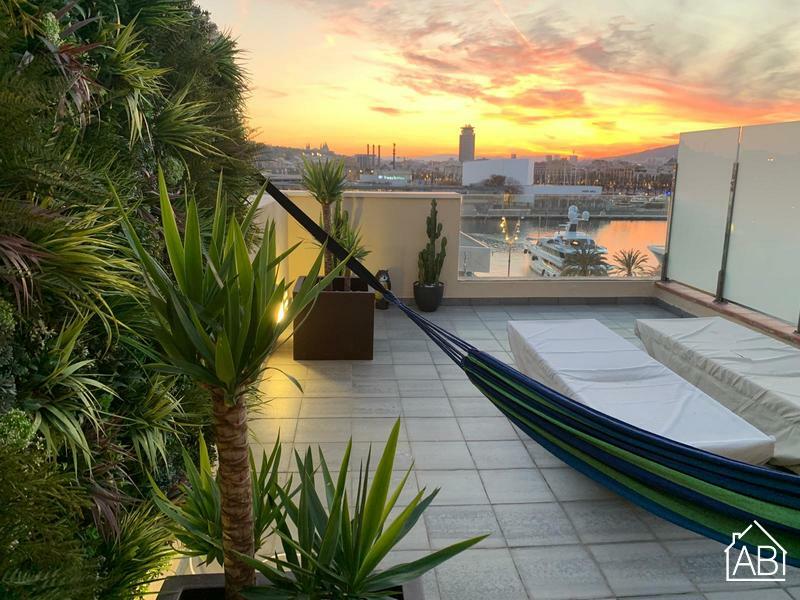 It has a fantastic location, and spectacular views of the sea, the lovely Port Vell (Old Port), La Sagrada Familia, the Columbus monument, Montjuïc hill and the Collserola Mountains beyond the city skyline. You can relax on the private 45m2 roof terrace, the balcony or on the beach just two minutes away. The apartment is surrounded by an abundance of bars, cafés and restaurants and is well-connected with the rest of the city, as it has a Metro station and several bus stops nearby. This luxurious apartment has 1 bedroom with 1 king sized bed (150cm x 200cm) with memory foam mattress, allowing up to 2 guests in total to stay here. The apartment has 1 bathroom. The kitchen is fully equipped, including a vito-ceramic stove and electric oven, allowing you to prepare your favorite food in this beautiful apartment. There are also plenty of amenities for your convenience, such as a TV (with free view UK channels), silent air conditioning (machines on the roof), heating, high speed, 100mbps fibre optic WiFi connection, a washing machine and tumble dryer. The apartment also has designer furniture and original paintings. The building is modern and has a security video entry system and elevator. Please note: Check-in at 2pm and check-out at 11am. Check-in after 5pm and check-out before 11am will incur an extra charge of 40€ paid locally. No business activity without prior discussion with the owner.